The rover has not used its drill since Dec. 1, 2016, when engineers noticed a problem with the drill feed mechanism, a motor which is supposed to extend the drill bit to touch the surface of Martian rocks. Two fang-like contact posts on each side of the drill bit press on the rock for stability, then the drill feed motor pushes the bit onto the rock before percussive and rotating mechanisms start boring into the target to collect a powder sample. With the drill feed mechanism no longer reliably working, managers have decided to keep the drill bit in its extended position. That raises concerns over the stability of the drill while in use because the prong-like extensions on each side of the bit will no longer be in contact with the rock. Curiosity touched its drill bit directly onto a Martian rock Oct. 17, according to a press release from NASA’s Jet Propulsion Laboratory. The rover was commanded to press the drill bit downward, then applied smaller sideways forces, according to a statement. A force sensor took measurements during the test. Engineers want to avoid applying too much side force while the drill is in use to ensure the bit does not get stuck in the rock. The drill is critical for collecting powdered rock samples from Martian rocks. Rock powder excavated by the drill goes into a collection chamber, where the material is sifted and sieved for delivery to miniature laboratory instruments on the rover’s science deck. The instruments measure the composition of the rock, helping scientists search for organic compounds and identify which rocks formed in the presence of water. Curiosity has drilled into Martian rocks 15 times since landing on the red planet in August 2012, and it used the stabilising contact posts each time. Assuming engineers see favorable results from the ongoing tests, the rover’s robotic arm will carefully place the drill bit directly on rocks during future drilling operations. Engineers working in JPL’s “Mars Yard” have used a ground replica of the Curiosity rover to test out the new drilling technique before beginning demonstrations with the robot on Mars. Ground teams also had to develop an alternate way to deliver the powdered samples to Curiosity’s science instruments because the procedure used before required the drill bit to be withdrawn, not extended. Ashwin Vasavada, Curiosity’s project scientist, told Spaceflight Now in an email that the leading hypothesis for the source of the drill problem remains foreign object debris inside drill feed mechanism, keeping its brake from fully disengaging. While engineers cannot rule out another cause, such as an electrical issue, the behaviour of the drill points to debris as the most likely cause. It remains unclear to engineers whether the debris was inside the drill before its launch and carried to Mars, or if contaminants were generated through using the drill after landing. An intermittent electrical short in the drill’s percussive mechanism cropped up in early 2015, prompting engineers to rely on the device’s rotating mechanism for some drilling operations. The percussive function is still available, but managers want to avoid using it unless necessary. 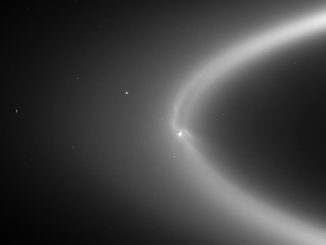 Curiosity is in its second extended mission phase after wrapping up its original two-year primary mission in 2014. The rover continued driving to higher elevations on Mount Sharp, a three-mile-high (5-kilometre) peak at the mission’s Gale Crater landing site, while ground teams studied the drill problem over the last 10 months. Observations by the rover’s other scientific instruments, including its rock-zapping laser, brush, weather sensors and cameras, have not been affected by the temporary loss of the drill. 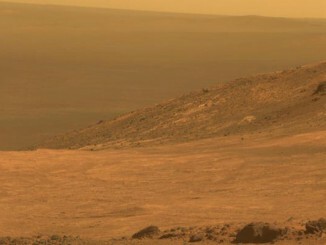 Curiosity is nearing the top of the 20-story-tall “Vera Rubin Ridge” on lower Mount Sharp, NASA said. The rover’s scientific focus there is the study of hematite, an iron-oxide mineral embedded in rocks that likely formed in an ancient watery environment. 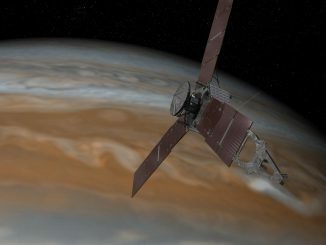 Ground teams are buying more time to study two sluggish valves inside the Juno spacecraft’s fuel pressurization system and postponing a major engine burn that was scheduled for this week to reshape the probe’s orbit around Jupiter.